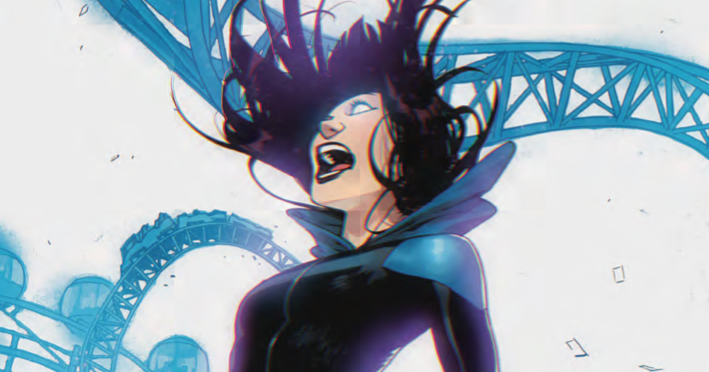 Raven #6 Review – AiPT! In the final chapter of “White Carnival”, Raven is facing the giant orb head on. Taking all the power she has, she’s entered inside the entity to retrieve her friends and now also her cousin. She will need all the help she can get to defeat the power taking over San Francisco. Marv Wolfman brings the story to a close, but is it the last we’ll hear from this evil presence? Is it good? Raven has entered into the orb. She’s hearing everyone’s cries for help and can’t do much of anything. The imagery of pain and suffering is chilling. Neves and Jose do an amazing job bringing the visual anguish to life. There are so many tortured souls being sucked dry by this being and Raven is fighting at every turn to keep her mind together. There’s a great section in the middle that is showing her memory loss. I’m really liking the way Wolfman’s story is looping to reveal the struggle. I was a little confused at first and thought maybe there was a mistake but it becomes evident what he’s trying to do after a few more panels. The art repetition really brings the idea home. The big emotional ending–because there has to be one–seems really special for Raven. For someone who isn’t used to family, I got a bit emotional seeing how everyone really came together for her. So, you’ve got lots of fighting, struggle and pain but it’s got a sweet, gooey inside. There are a few references to Teen Titans and Justice League closer to the end of the issue which seems to be bringing our groups back together. I like the idea but I see so much more with Raven on her own so I’m hopeful they’ll do another spin off for her; she’s a great stand-alone character. A few little things I didn’t really think worked: the cover art was okay but I really enjoyed the issue’s art better. Raven was much more defined throughout the book; I was also really confused about all the memory loss–it made sense when it was fighting her but the fact that it continues is just odd to me. I know there has to be a closer but it seemed like an easy way out.